How do you double the value of a Yugo? Fill up the gas tank. Yes, the Yugo was a dud. Seldom have three letters so captured the essence of a vehicle. But as you pack for the beach this summer, you can bring the Yugo along for a good laugh. 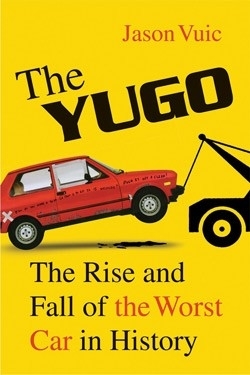 "The Yugo: The Rise and Fall of the Worst Car in History," by Jason Vuic, is a great reminder that this wonderful and crazy business has more than its share of jokers, hucksters and weirdness. DISCLAIMER: The book was given to me by the author. And I thank Vuic, an assistant professor of history at Bridgewater College in Virginia, who tells the tale with great insight and humor. Take his account of the moment Malcolm Bricklin first spotted a Yugo. Bricklin had been importing cars from Italy's Bertone and Pininfarina, but sales were tanking. He was desperate for another car to import. In April 1984, he met with British Leyland. They didn't bite, but as Bricklin and his cohorts left the company's London office, they spotted a small car parked down the street with "JUGO" written on it. That chance sighting led to an automotive phenomenon. The book is filled with capitalist entrepreneurs, socialist factory managers, engineers who labored to bring the car up to snuff, and even war criminals. Not to mention consumers who initially lined up to buy a bargain (just south of $4,000), and the late-night TV comedians who provided lots of free publicity. Every chapter opens, appropriately, with a Yugo joke. I'm sure this summer will bring plenty of auto books. They'll sing the praises of the Corvette, or the Nissan Z, or some other sports car, race driver, or automotive bigwig. But you're not likely to enjoy any of them more than this book.